I have surprised myself by being able to answer all of the questions in Rory’s latest “Game-On” challenge. Afterall, I have been shopping in charity shops since I was sixteen because as a volunteer, I did not have much spare cash for clothing. I know nothing of what is supposed to be the fashion. I just know what I like and what I think looks good. In my life…oooh, well colour is gorgeous. Goodness, imagine life without colour! Wouldn’t that be boring! Well, I like blues and greeny blues, teal I guess. Any colours at the cooler side of the rainbow. I use navy as my base colour instead of black. As I think black makes me look too pale and sickly. I team various shades of blues and teals with either neutral items or tan leather or accessories. I used to have something in every colour going, but ended up with too many clothes, most of which could not make a matching outfit. I have a very small wardrobe now, so I have a capsule wardrobe all based on my favourite colours. Frustratingly…people love me in pink. It is because I am fair with golden hair and I turn pink very easily. My rosy cheeks look amazing in a rosy pink top. Not hot pink, not pale pink, but that rose kind of pink. I always receive compliments whenever I wear that shade of pink. So, I do have a bit of it in my wardrobe. I have a couple of navy dresses with a bit of pink in the floral print and I team it with a little pink cardi. It is something I would wear when I am feeling a bit low, as I know people will say I really suit that colour. In every day life, if I am out and about, meeting and greeting, socializing, and especially when I am wanting to look lovely for Goldfinch, I love wearing a dress, a beautiful dress, or a day-dress. I just love feeling feminine. Most of my dresses are knee-length or just below and they are “fit & flair” style as it suits me more than a straight cut dress. Oooooh…it depends on the season. Now that the cold weather is ahead, I would not be without my 100% waterproof Gortex tan leather boots. Someone gave me some money to go and buy some good winter boots because my old boots were springing leaks and I bought a pair in Clarks in the sale for about £70 and I love them. three years later they are still in almost perfect condition despite how often I wear them in the wintertime. Also in the winter I love my big thick navy coat. My big woolly scarf which is navy and teal check. I have a “go-to” dress when I am not sure what to wear. It is a Phase Eight dress, navy with a panel of burgundy along the bottom of the skirt and two side panels in burgundy. One of my friends calls it my “Star-Trek” dress. It is “fit & flare” and it is incredibly flattering and easy to team up with most items in my wardrobe. I found it in a charity shop and snapped it up and I love it. I do dress for the weather. I don’t really change my colours drastically…most of my clothes are blue or teal or navy. I might wear more white in the summer. If my friends tell me (and I often need their advice) that is more of a dressed-up jeans smart casual, I have some pretty tops and jackets that I can team up with jeans. Left to my own interpretation, if I was told the dress code was smart casual…my first choice would probably be a dress, knowing me. But a dress that was not too glamorous or opulent. A navy day-dress with a thin tan belt. I would probably wear it with smart but flat ballet pumps, which give a dress a more relaxed feel. …something more along these lines. I feel rather embarrassed about this. So recently, my sister Milly went up to my flat up in North London to retrieve some things that would be useful to me. Only she brought back so much more than I expected, and for some reason she decided to bring my entire shoe collection. Well, actually, I have a few pairs of footwear up at my parent’s home and at my sister’s homes. The problem is…I am very good at finding bargains in charity shops after years of practice. Most pairs of shoes I have bought for just £2 or £3. I look after them because they are well-made shoes, and I have a friend who is a cobbler who has helped to keep my shoe collection looking polished! that I guess could never really go out of fashion. I feel like they are a kind of Audrey Hepburn look and can be worn by anyone of any age and make them look smart and stylish. I don’t think I am into anything outlandish. I think on the whole my dress sense is rather conservative. I like to wear beautiful dresses, but on the whole I like to wear clothes that are modest, well-made, appropriate for the occasion. I don’t like to draw attention to myself, but I like to be well-presented and look as if I am making an effort. I don’t think about fashion. I don’t talk about fashion. 90% of what I own I bought in charity shops. 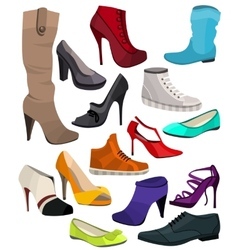 It is only good quality footwear and underwear that I am willing to buy new! But I found one quote which isn’t completely laughable to me. If I am playing hockey…knee high socks. If I am jogging…little ankle socks. What are shin socks? I don’t know what they are…are they like socks with shin-pads sewn into them? If so, they would be great for hockey. If I am wearing sandals…no socks. 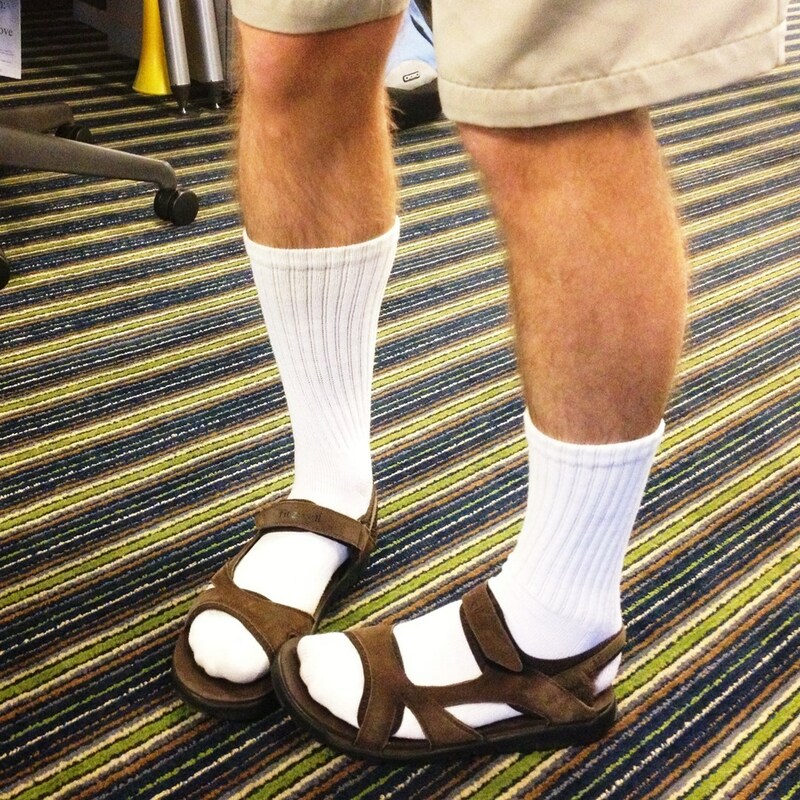 If there is one crime against style it is socks with sandals – aaaaaagh!!!!! I don’t think my mind is wired to see the connection between colour and music other than they both make life rather exquisitely wonderful! I think they both sensational gifts that make life anything but boring. I don’t think music influences my dress code. I love colours, but for practical reasons (lack of space), I stick to my capsule wardrobe of blues and teals and tan leather. If something I already own and is very useful is wearing out, beyond repair, I start to pop into charity shops to see if I can find something similar to replace it. I do pop into charity shops from time to time, always on the look out for a bargain. Well, I don’t believe I ever wore anything tie-dye. But that is probably because I am a child of the eighties. I think I would have liked it, I liked bright colours and wore all sorts of colours as a child. I don’t think I would wear it now though…I don’t like to dress in an entire rainbow of colour, I think I would feel too conspicuous. I don’t have any strong feelings about tie-dye. For those that can pull off wearing the entire rainbow – good for you! I have a raspberry Laura Ashley light cardi. It is pretty. 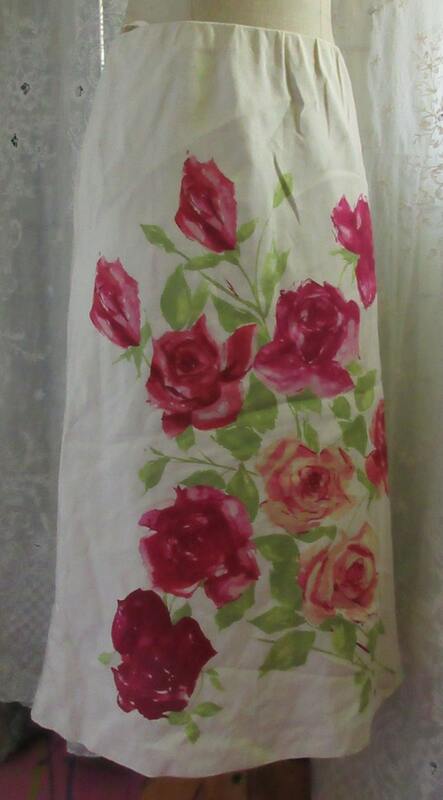 I wear it with a Laura Ashley skirt which is beige but has a rose print on it. Everything else in my wardrobe is navy, teal, blue, or neutral colours. Well…I think the item that was the most expensive originally is a Windsmoor winter coat which I found in a charity shop with the labels on and snapped up for £20. I feel as if it is one of my best bargains. 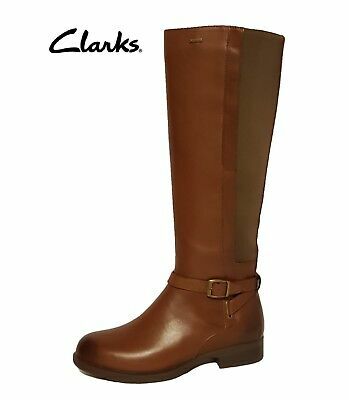 I guess the most money I have personally spent was the £75 for the Clarks boots I mentioned earlier in this post. I don’t feel as if I am “fashionable”. I am not really aware of what is in fashion at any time. However, I think I have a style. I wear what is appropriate for the occasion – so practical clothes when I am doing practical tasks, and then when I am not getting my hands dirty, I wear dresses. I have always liked beautiful dresses, right from childhood. I developed that sense of “style” as a little girl and it has ever left me. Although I have had a life-time of “hand-me-downs” and charity shop clothes, I have always chosen items that I feel comfortable and confidant in. Hardly anyone would have any idea that I don’t buy my clothes first-hand. Stylish on a shoestring! Once more Mel never disappointed – l feel you and my Mother would get along rather snugly. she taught me how to shop in charity shops when l was teenager because l found that l didn’t like new clothing so much, way too scratchy in comparison to worn, which of course back in the 70’s and 80’s much of charity was of course worn clothing, whereas now, with the disposable society we live in, much of the clothing is many a time either once worn or never worn. Suze speaks volumes about a quality pair of sandals, l can not stand them at all! Eeek, l am so clumsy that l would lose foot digits or stub my toes! The most l wear is crocs and l have problems with those, l do wear socks with them unless it is summer then l don’t but my feet then feel like they have been superglued into them. as for sandals and socks, if that ever happened l have given Suze permission to shove me off a cliff! Great choice of song, reminds me l must do a Frank Sinatra TOTW and dedicate it to you l feel, you have used Frankie a few times in videos, plus his very style l think is very much your style. Love the capsule wardrobe with classic colours, l remember training in capsule management back in the 80’s oddly enough with Dorothy Perkins when l managed their stores. Always fun to prepare a post in response to your challenges! I think I would get on great with your Mum. Oh bless, Suze would be doing the right thing if she had to shove you off a cliff because of wearing socks and sandals! I love that you have experience in so many fields (I mean fashion, music, caring for animals…and more). You know what is worse and YET we still see it oddly enough? Socks and sandals and knotted hankies on head – why? Why would anyone want to put a snotty hanky on their head? My Father did it a couple of times and he DID used to wear socks and sandals and thought it looked ………….. cool!!!?? My Mother corrected him pretty quickly, but it was a challenge! Hankies on head – oh no, you are going to give me nightmares! Now we have discovered the root cause! Had l known, l could have saved all that damn money with the therapy! “White Socks, Open Toed Sandals and Snotty Headkerchief! Ha ha yer, boingo boingo, nuffink wong wiff me yer yer! Wow, such a detailed and well-considered response. Love the choice of quote. So much fun responding to one of Rory’s challenges! Thank you Sadje…always fun to do one of Rory’s challenges!